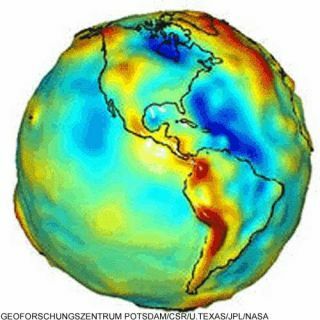 To pin down frame dragging, researchers included data on Earth's uneven gravity field, shown in this map by NASA's GRACE satellite. Fluctuations owe to mountains, trenches, and unseen sub-surface density differences. Red indicates high gravity; blue areas have low gravity. Earth's spin warps space around the planet, according to a new study that confirms a key prediction of Einstein's general theory of relativity. After 11 years of watching the movements of two Earth-orbiting satellites, researchers found each is dragged by about 6 feet (2 meters) every year because the very fabric of space is twisted by our whirling world. The results, announced today, are much more precise than preliminary findings published by the same group in the late 1990s. Any object with mass warps the space-time around it, in much the same way as a heavy object deforms a stretched elastic sheet, explained study leader Ignazio Ciufolini of the Universit? di Lecce in Italy. If the object spins, another distortion is introduced, "in the same way as the elastic sheet would be twisted by a spinning heavy wheel on it." If the space around Earth is being frame-dragged, then satellites ought to be caught up in the deformation, scientists reasoned. Imagine how a second object on the elastic sheet would be moved by the scrunching motion created as the sheet is deformed. Ciufolini's team analyzed millions of laser signals bounced off two satellites, called LAGEOS and LAGEOS 2. Both are highly reflective spheres not designed to do any work of their own. They look like 2-foot-diameter (0.6m) golf balls and contain no batteries or electronics. The researchers say their result is 99 percent of the predicted drag, with an error of up to 10 percent. The details will be reported in the Oct. 21 issue of the journal Nature. The analysis is "the first reasonably accurate measurement of frame-dragging," said physicist Neil Ashby of the University of Colorado in Boulder. "Precise measurement of these effects predicted by relativistic gravity theories is crucial, as they have important implications for our view of the cosmos," Ashby writes in an analysis of the study for the journal. Specifically, the new results can be applied to black hole theory. In fact, it is with black holes -- typically much more massive than Earth -- that some of the first signs of frame dragging were spotted. In observations of activity around black hole in 1997, researchers noted that gas spiraling into the black hole wobbled, or precessed, like a top. The precession was much greater than what could be described by basic mechanics of the setup. And as early as 1996, Ciufolini's team saw signs of frame dragging on the Earth-orbiting satellites in their study, but the initial results had a high degree of error owing to the lack of knowledge about Earth's gravity field, which is not symmetric. A gravity map generated by NASA's new GRACE satellite made the latest analysis possible, he said. Meanwhile, other studies have shown that black holes indeed spin, and that frame dragging plays an important role in spewing tremendous jets of material out of the environments around black holes. The whole setup can be likened to a giant gyroscope, Ciufolini told SPACE.com. A jet can point in one direction for millions of years, other observations show. "In other words," Ciufolini said, "an astrophysical gun was shooting for millions of years without changing direction: a fantastic gyroscope indeed." The surrounding blue and white rings are hot gas whirling around and toward the black hole, much like water near a bathtub drain. The green grid depicts space-time coordinates, distorted by the spinning black hole at right.